This product requires Proof of Purchase. Email: pearl@p3designs.com with the Proof of Purchase UPC code found on the back of your pattern. We will email you a PayPal invoice. When your payment is completed your PDF download will be emailed to you. You must be able to Download, Open, Print and Save a PDF to use this Downloadable product.. 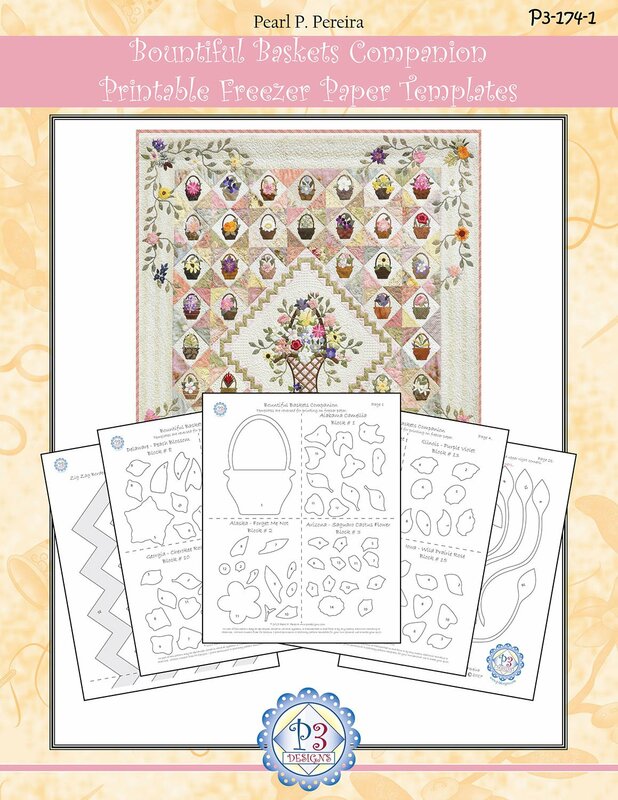 This 24 page companion download PDF contains the already mirror imaged separated applique shapes ready for printing on Ultimate Applique Template paper, other printable freezer paper sheets or Fusible web sheets. We know this will help you get right to work making your new wall-hanging. Pattern not included.The printable Templates are only sold online as a download for my web site retail customers only. For those of you who have ordered your pattern from a quilt shop or online store. Email pearl@p3designs.com with the pattern Proof of Purchase UPC Code found on the back of the pattern.